The atmosphere and the scenery are all wonderfully done, and it really feels like a top notch production. 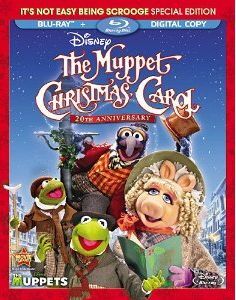 As I said, it's not as funny as the first Muppet film, but then A Christmas Carol was never meant to be a comedy. It does bring about the laughs when appropriate, and leaves them out when they would otherwise spoil the mood. Obviously it's a great story, and even I'm sure we're all pretty sick of it by now seeing how almost every TV show tends to do one of these near Christmas, this version still feels like a good one to have available around the house. I totally wouldn't mind seeing it once a year during the holiday season.